Cesar Chavez Day honors a legacy of respect, dignity and justice for all working families. 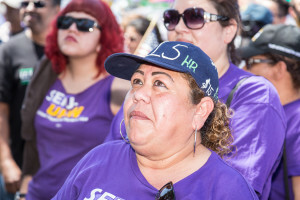 Yet, more than 50 years after a significant victory for farm workers following the Delano Grape Boycott led by Cesar Chavez, Latino communities continue fighting to for fair treatment and fair wages. A key tenet of the struggle Chavez led was to ensure that all working families earn a living wage. Since then many organizations and labor unions like the Service Employees International Union and the CA Labor Federation have advocated for a minimum wage increase to $15 in cities and states nationwide. Yesterday, on Cesar Chavez Day California’s workers moved ever closer to making history increase to $15 in cities and states nationwide. Yesterday, on Cesar Chavez Day California’s workers moved ever closer to making history again when the legislature sent a statewide $15 minimum wage to Governor Brown for his signature! The $15 minimum wage bill, SB 3, will give millions of working Californians a raise to $15 over the next few years. This historic wage increase will be especially impactful for California’s Latino families. “…Today, millions of Californians secured life-changing raises that will lift our families out of poverty,” said Guadalupe Salazar, a McDonald’s worker in Oakland. With $15 an hour many Latino workers like Guadalupe may be able to afford a car loan, live closer to work, have more food security or have access to other basic necessities they currently do not have. As workers across the United States continue to call attention to our country’s soaring income inequality and fight for a living wage, California is poised to declare victory in the fight for respect, dignity, and justice for Latino families and communities.